Because of the election of 2019, IPL 2019 schedule cannot be confirmed. Problems for BCCI is increasing every now and then. IPL 2019 Venue is also not confirmed yet. 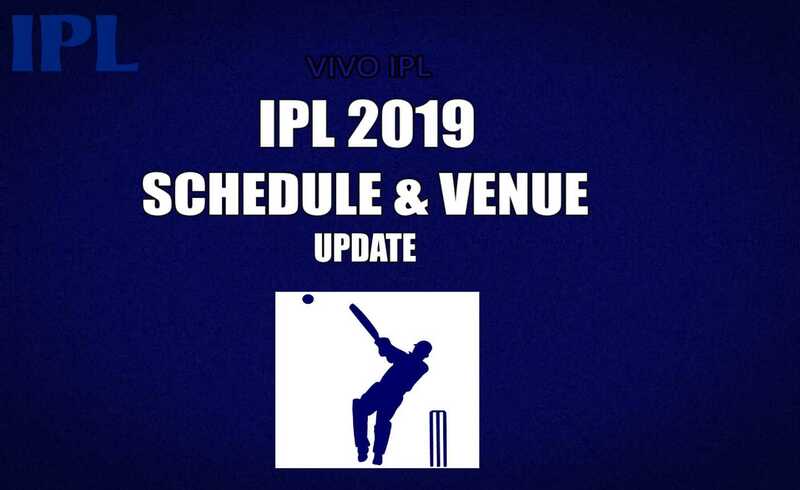 But I have some updates related to IPL 2019 Schedule and Venue. Today I will tell you what kind of schedule update is going on till now. I have seen many channels and blogs are misleading you with misinformation about IPL 2019 Schedule Update. Today I will tell you what is going on in reality inside BCCI and when will BCCI release final IPL 2019 Schedule. So read below for the complete information about IPL2019 Schedule Update and if you IPL 2019 to be held in India, then definitely tell me in the comment below. Here Check the most recent top 5 IPL 2019 Schedule Update also check about IPL 2019 Venue update whether it will be held in India or South Africa of UAE will be the venue for IPL 2019. The first update is coming that Virat Kohli made it clear that the IPL should be finished as quickly as possible so that the players can save time before WorldCup for their practice. And because of this, IPL can start on March 23rd, which was going to start on March 29th. So the first information is coming, IPL 2019 can start on March 23 so that it can end before Worldcup. On the second IPL 2019 Schedule Update is that BCCI wrote a letter to the Election Commission in which they had requested some information about the schedule of the election so that IPL 2019 Schedule could be decided. But the election commission has refused by giving any information about the schedule of the election. This is the rule of the Constitution. And that's why BCCI is constantly facing the problems in releasing anything about IPL 2019 Schedule. BCCI wants to have complete IPL matches in India only, for which BCCI has already set up everything, but before giving any update about IPL 2019 Schedule, BCCI is waiting for the schedule of elections to be released, for which BCCI has written a letter to Election Commission of India. The third update is that if the entire tournament cannot be held in India then it has been decided to be played in IPL South Africa. That is why the BCCI has sent some of its officials to South Africa, where they had examined grounds and pitches and BCCI was satisfied with the reports. So if the full IPL will take place outside of India then it will be in South Africa. If there will be some matches to be played outside of India, then it will be in UAE. The last update is that some players from Australia might not be playing for the whole season of IPL 2019 because perhaps at the beginning of April, Pakistan can play a series with Australia, so the players who are playing for Australia may not be available for the whole season. This can increase BCCI's problems in IPL 2019.
these are the four new updates regarding IPL 2019 Schedule Update. 5. BCCI may introduce a new format or some changes in the IPL 2019, I will keep you updated about all that.